An integral component of the Canadian History Hall project is transforming the space into a new major gallery dedicated to telling the stories of Canada. The Museum is proud to be working on this transformation with Douglas Cardinal, the Lead Architect for the Canadian History Hall. Architect, designer, planner, activist, philosopher, artist — Douglas Cardinal is that and more. His life is dedicated to creating beautiful, thriving, harmonious built environments. As an architect he builds buildings; as a planner and activist he builds communities; as a leader and philosopher he builds bridges between dispersed cultures all over the world. Douglas Cardinal personifies the timelessness of a masterbuilder. Douglas Cardinal was born in Calgary, Alberta in 1934. The son of a game warden, he studied architecture at the University of British Columbia and the University of Texas, graduating with honours in 1963. He practised in Edmonton for 18 years and then moved his practice to Ottawa in 1984. The Museum recently sat down with Douglas Cardinal to discuss his role in the project. Read below to see what he has to say. 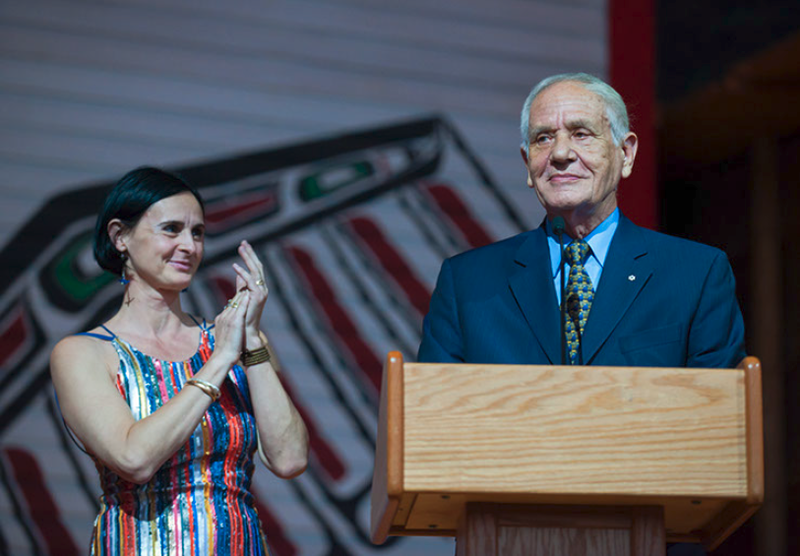 Douglas Cardinal with his wife, Idoia, at an event held at the Canadian Museum of History last June to celebrate his 80th birthday. Museum: The Canadian History Hall is the most important project the Museum has undertaken since the construction of its current buildings, 25 years ago. What is your role in this project? Cardinal: My role in the development of the Canadian History Hall is that of Lead Architect. As such, it is my responsibility to develop the architectural concept of the hall and to coordinate the architectural, mechanical, electrical and structural engineering disciplines as well as the code consultants. I will also integrate the concepts of the Museum’s professionals as well as the themes and visions of the exhibition’s designers, who are expressing a new and exciting narrative of the history of Canada, created by Museum scholars with the advice of experts from across the nation. Museum: What will the Canadian History Hall offer its visitors? Why is it important? Cardinal: In the past, Canadian history was seen as starting after European contact with Canada’s Indigenous Peoples. The revised scholarly narrative of Canadian history will start with the First Peoples inhabiting the land following the last Ice Age 10–15,000 years ago. It will start with the cultures that thrived on this land for thousands of years and will illustrate their history and culture, which grew out of our Canadian landscape. It will describe their contribution and the changes to their way of life after European contact. It will show how the French and the English relationship with the land and with the Indigenous Peoples shaped and reshaped our whole Canadian society, as well as the many people that came from countries around the world, who also shaped our destiny and have made a great contribution in shaping this country, where multiculturalism thrives. Indeed, respect and tolerance is something we share as Canadians. Canada’s story is important to other nations of the world because it sets a fine example of how people of different races, creeds and cultures can thrive together in diversity and produce a culture of dignity and respect for all of its citizens. Museum: How does this project connect with your initial vision for the Museum? Cardinal: Originally called the “National Museum of Man,” the Museum was designed as an organic expression of architecture evolving around its functions and showcasing the history of the cultures that created our nation. The Museum is a dynamic sculpture inspired by the powerful Canadian landscape, sculpted by wind and water. The building embraces the Ottawa River and the majestic view of Parliament. The History Hall is designed to emphasize the openness of our people and the vast space of the land we call Canada. It opens to all the halls in the Museum, for cross-referencing, to emphasize the vast space of the Canadian territory and the open relationships we share across our land. We designed the hall to have natural light. The Canadian History Hall will take full advantage of the original architectural design of the building, including the view, which honours Parliament Hill. The mezzanine will symbolically flow in sweeping forms like the Ottawa River into an oval ramp, symbolizing the natural phenomena of the “Great Kettle” (Chaudière Falls), which Indigenous People saw as a power centre for the Nations. It has since become the power centre for all Canadians as the nation’s capital. This strong symbolic form in the Canadian History Hall will be the backbone and the hub, presenting our whole history as a nation, expressed by the existing architectural forms. Museum: You have said before that the “Museum building itself is an artifact of its time.” Why is that? Cardinal: The Museum was conceived as a work of art. As such, we are required to preserve its artistic integrity as a sculptural representation of the people of Canada and the dramatic landscape they inhabit. The Museum itself and its shape aspired to be a symbol of an evolving organic nationhood, to enshrine the diverse cultures of Canada. It has been recognized as a Canadian icon, receiving national and international recognition. Learn more about Douglas Cardinal’s work on his website at www.djcarchitect.com.